Infinity illusion candles create a stunning optical illusion of candles stretching off into the distance. Thanks to it's clever optics, the infinity illusion candles make one candle look like hundreds stretching off into infinity. Thankfully however, there's only one candle used, which saves a lot of time when lighting it. The Infinity Illusion Candle is supplied complete with an assortment of tealight candles to get you glowing straight away and can be wall mounted too. 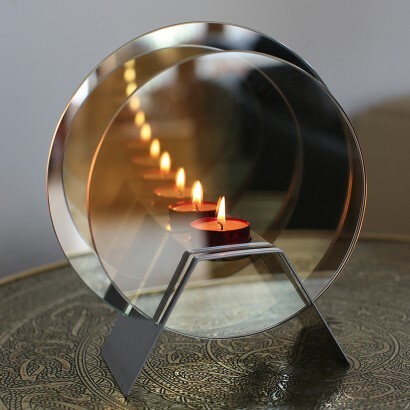 The original round Infinity candle features two circular glass mirrors which, when positioned in the metal base creates a round tunnel of reflecting lights. The two circular mirrors - one larger back mirror and one smaller 2-way mirror sit into the metal base and the rear mirror can be tilted and angled slightly to adjust the direction of the infinity effect. A really nice unusual candle holder and light piece it looks fantastic in the center of my coffee table. 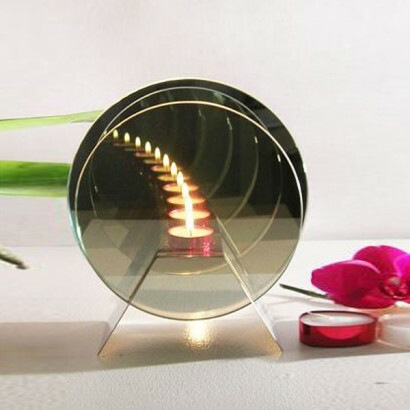 I asked a friend what she wanted as a present and she selected the round infinity candle. I had never heard of this but can see why she liked and wanted it. No surprise that it was a great success and she is really pleased with it. Online purchase was easy with only one niggle - I was shopping from outside the EU but my country was not listed. Only EU countries are offered as options. So for the purpose of this purchase I was temporarily resident in Ireland. May come as a surprise to Irish border security and definitely to me!! Bought this for a friend's b/day. We both fell in love with it. 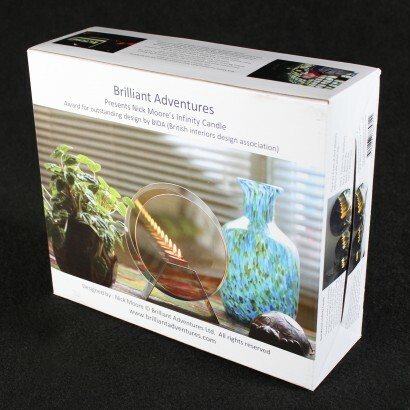 It's fantastic - a terrific meditation tool. Sadly, it's too big for my needs, I desperately need a smaller one!! I love candle light and this infinity candle was certainly a wow for me, not only that but all my friends and family who have seen it loved it and it has certainly been a talking point.